When the car I was in broke down on the edge of a cemetery last week, I left my hubby waiting for the breakdown services while I went for a stroll among the tombstones. It was beautiful and peaceful in the graveyard, the sun was shining after a morning of rain and everything was glistening. There were clumps of soft, green moss and bright yellow lichen on the old stones, bees busy among the comfrey plants and foxgloves and ducks and geese with their young on a pond. My hubby and I had been on the way to see Godzilla at the cinema, which we missed. But while my hubby looked like he had more steam coming out his ears than had been pouring out of our car's engine, my main regret at the unfortunate change of plans was that I didn't have a real camera with me. The wildlife in the cemetery was just as fascinating to me as fictional giant lizards. 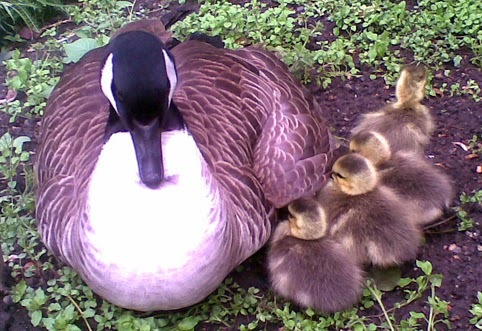 I took this photo of a goose with goslings using my camera phone. My attempts at photographing the mossy gravestones and busy bees failed to capture the magic of the moment. On each Pagan Eye post, I show a photo that I find interesting, with a few words about it - it could be a seasonal image, a pagan site, an event, or just a pretty picture. If you want to send me a photo for a Pagan Eye post, please email it to badwitch1234@gmail.com Let me know what the photo shows and whether you want your name mentioned or not. For copyright reasons, the photo must be one you have taken yourself and you must confirm that you are submitting it for A Bad Witch's Blog.